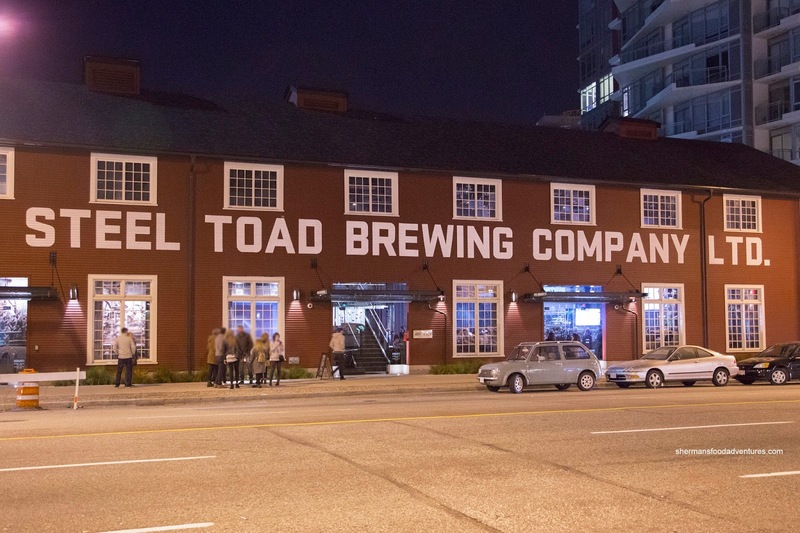 When it first opened, the Steel Toad Brewery sported one of the best (if not the best) dining spaces in the city. Occupying the heritage Opsal Steel Building on East 2nd at Quebec, the expansive room features an incredibly high ceiling with plenty of natural light. 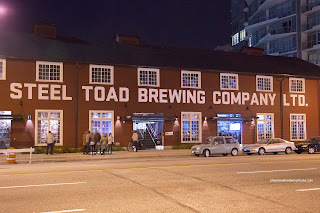 I originally visited the place when it first opened and although the brews were tight, the food was not. 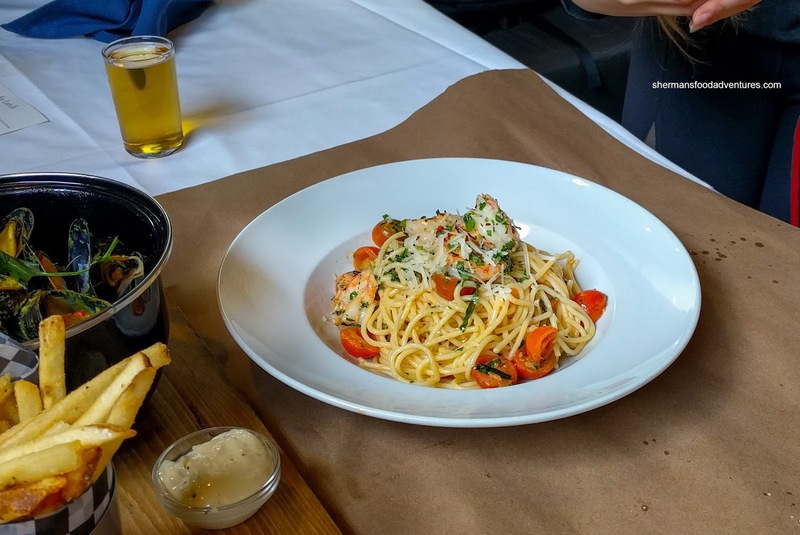 It seemed like they wanted to rely on the venue and beer rather than putting any effort into the menu. However, times have changed where both the management and head chef have been replaced. 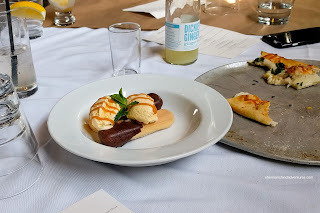 I was invited for a tasting to see if the food could finally live up to the building. 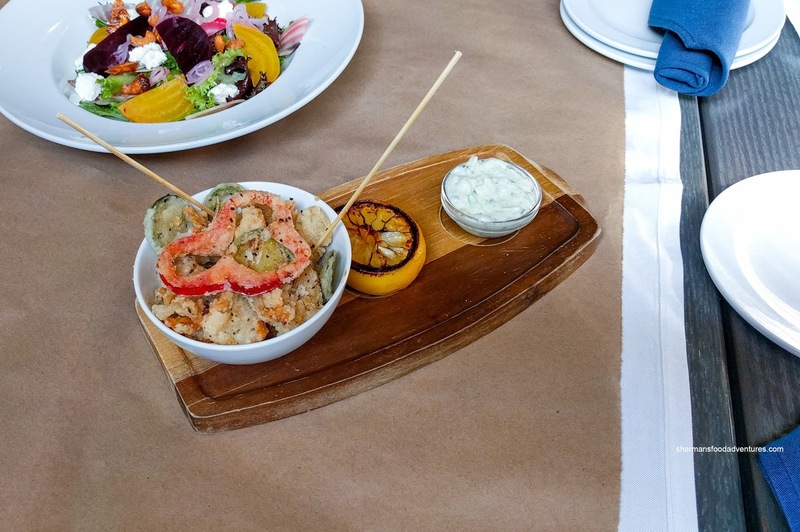 We were started off with the Calamari marinated in buttermilk, fried and tossed in house lemon seasoning. I found each piece to be crispy, peppery and lightly seasoned with acidity from the charred lemon. The batter stayed adhered to the tender squid (which still retained a nice rebound). On the side, the house tzatziki was creamy and bright with plenty of tang. 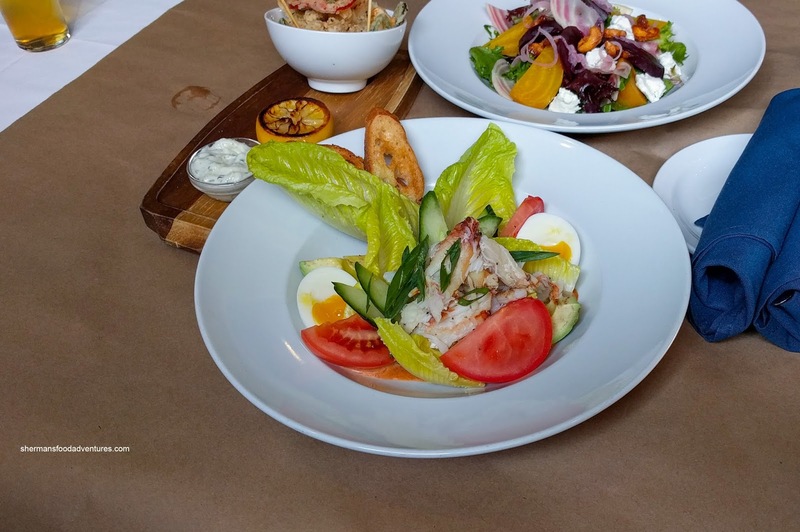 Next up was the Crab Louie which was an homage to the year the building was built (since the salad was popular then). They updated the plating where the tomato cream dressing was on the bottom. This kept everything from being over-dressed and also created a clean appearance. The veggies were fresh and crisp while the abundance of crab leg meat was fluffy and sweet. Loved the restrained touch of horseradish as it added a robust, yet not overwhelming sharpness to the dressing. 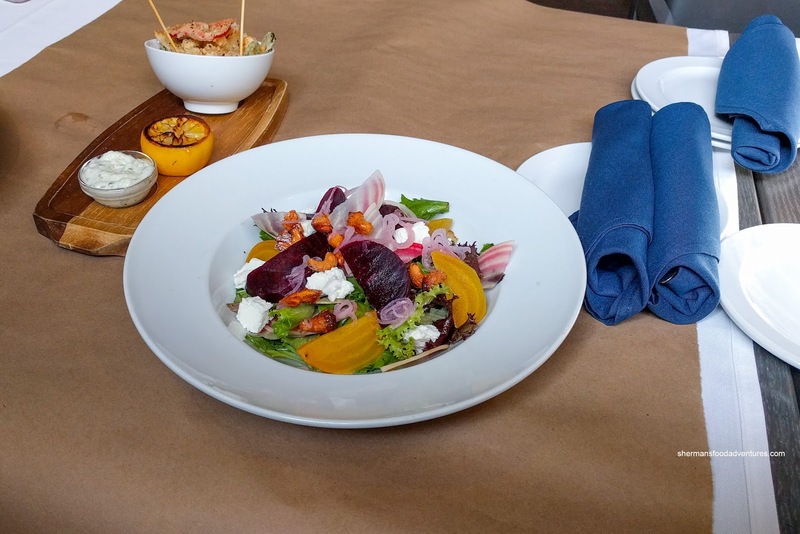 We continued with the Beet Salad consisting of California spring mix and 3 types of beets dressed in a house vinaigrette. 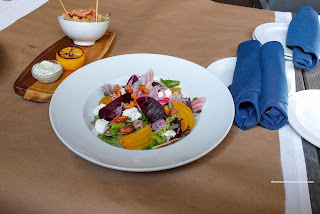 I found the salad to be light with tender beets that were more sweet than Earthy (in fact, they weren't that Earthy at all). The big clumps of goat's cheese added a notable creaminess that was welcomed. With a nutty and sweet crunch, the candied cashews were plentiful as well as the tangy pickled shallots. 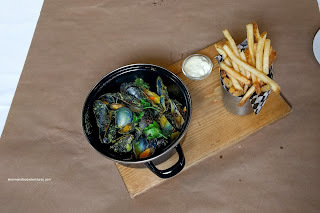 Presented in a large steamer, the Mussels and Frites was plenty tasty. The lemongrass yellow curry was impactful where all the different ingredients were noticeable including shallots, ginger and garlic. The broth was sweet and gingery with a lingering spice. There was also plenty of acidity and a hint of cilantro. I found the mussels to be buttery fairly plump. The side of frites were crispy, but very salty. The best dish hands down was the Argentine Shrimp Spaghettini with fresh cherry tomatoes, shallots, garlic, chili flakes, fresh basil, white wine, lemon juice and grana padano. Again, every ingredient listed was integral to the dish and announced itself with every bite. I got the sweetness of the shrimp that gave way to a lightly spicy garlickiness. It ended with the brightness for the basil, tomato and tang from the lemon. I would order this again in a heartbeat. 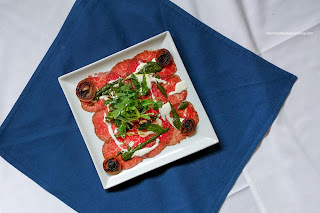 With a crispy gorgonzola polenta cake in the middle, the Beef Carpaccio was more substantial than most versions. It featured thin slices of buttery Wagyu beef drizzled with an herb puree and horseradish cream. 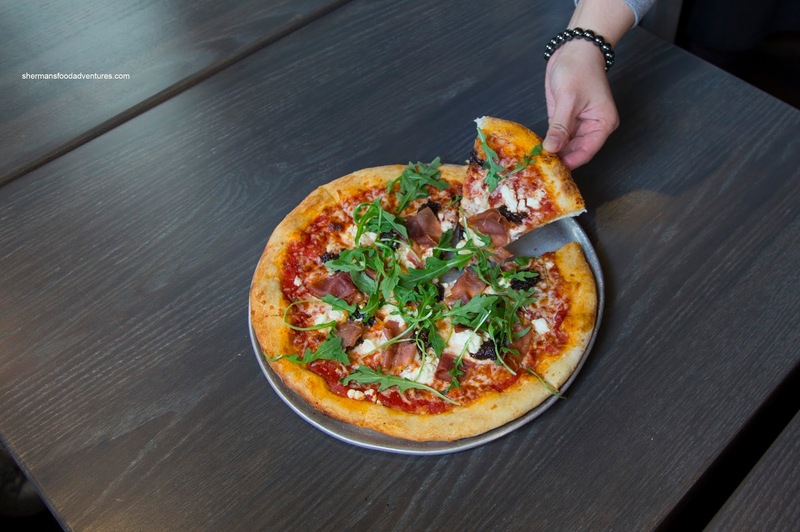 The flavours were more subtle than its appearance where it was creamy and bright accented by the acidic and peppery arugula salad. The one dish that wasn't my favourite was the Albacore Tuna Tartare as it was overdressed with Korean chili paste (gochujang). 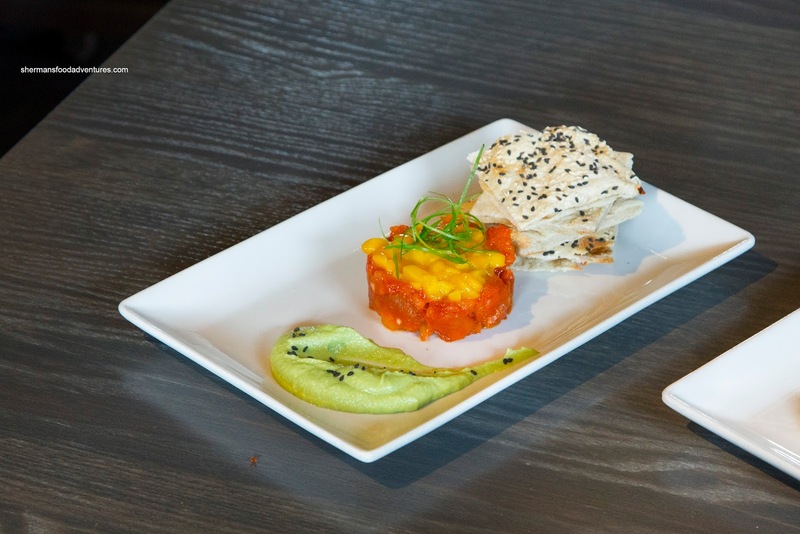 This meant the delicate and buttery tuna was completely obscured and overwhelmed. On the positive side, the flavours were bold with spice sweetness and acidity from the mango and ginger lime vinaigrette. To make the whole thing even creamier was an avocado cream. This was served with house-made sesame "crackers" which was akin to pizza bread. 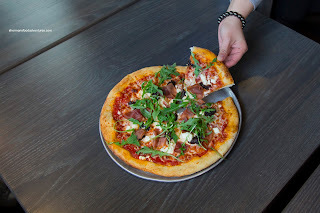 On the topic of pizza, we were served a duo including the Fig & Prosciutto with goat's cheese and fresh basil. Since they used aged dough, the crust was chewy, yeasty, tangy and nutty. It was thin and crispy while nicely salted. I thought the amount of fig was a nice counterbalance to the salty prosciutto. I enjoyed this pizza, but the Pear, Pork Belly & Gorgonzola was universally more loved. 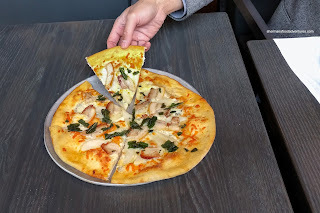 It didn't have any sauce, but that wasn't an issue as the moisture from the ingredients provided the right balance that kept the crust crispy. The nutty and crunchy crust was a nice textural contrast to the soft sweet pear and tender melt-in-our-mouths pork belly (which was aromatic in a roast pork manner). 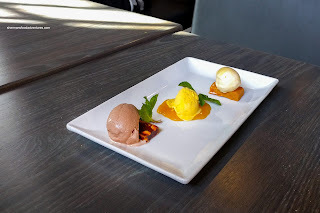 For dessert, we were served a Trio of Ice Cream featuring Nutella atop hazelnut brittle, Mango with mango coulis and local Clover Honey atop honeycomb. These melted fast and was an indication that they were house-made and didn't contain any stabilizers. They were creamy and purposefully sweet. My favourite was the honey as it really did capture the essence and aromaticness of honey without being crazy sweet. Mind you, the honeycomb was pretty sweet. This was a fitting end to a surprisingly solid tasting. Compared to my first visit, the food quality and execution has vastly improved.